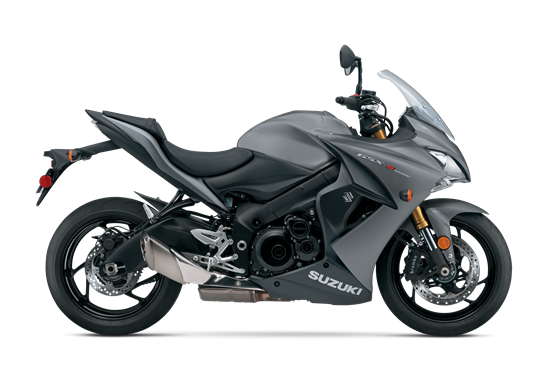 Equipped with a powerful engine, Suzuki’s Advanced Traction Control System**, a balanced KYB suspension, plus ABS-equipped* Brembo and NISSIN brakes, the GSX-S1000F ABS is a street bike packed with some serious performance. Top that performance off with wild, rugged, and aggressive styling, a wind-cheating fairing and screen, and you have a touring-ready sportbike ready for the open road or corner carving. The GSX-S1000F ABS premiered Suzuki’s Easy-start System that requires just a simple touch of the starter button to fire up the engine (without pulling the clutch lever if the transmission is in neutral). Styled to complement the rest of the chassis and to house a bright dual headlight, the GSX-S1000F ABS’s full fairing slices through the wind while so the rider benefits from the upright, sporty ergonomics. Link-type rear suspension, with arched aluminum swingarm and a single shock absorber that features spring preload that is 7-way adjustable with rebound damping force adjustment. The reasonable sport riding position is created by a carefully crafted relationship between the Renthall FatBar, footrests and seat. Both the front and rear brakes can be modulated by a compact Anti-lock Brake System* (ABS) controller to match stopping force to the available traction. Unique to the GSX-S1000 models, the TRP 6-spoke lightweight cast aluminum wheels are shod with Dunlop radial tires (120/70ZR17 front and 180/50ZR17 rear). The dual headlight assembly in the full fairing use a pair of 55W H7 halogen bulbs – one for the low beam, while both illuminate for the high beam. The tail section houses an integrated LED taillight with clear lens.